Johnson’s Dictionary is not the best one written for or in the English language—the dictionary that sits forgotten on your shelf is probably named Webster and not Johnson, after all, and the website that you use instead of a book is also not named “Johnson.com” or something like that. This project would be difficult enough to produce in our era of desktop publishing (is there an app available for dictionary creation? ); Johnson put together his dictionary in his house, with workmen appearing every so often to assemble a printing press and run off some pages. He paid them out of his own pocket. His personal library, large but not comprehensive, was supplemented by books that he borrowed from friends. The books were so covered with his notes that they were not worth being returned, the friends remembered. It took him nine years to complete the dictionary, yet he had promised it in three. 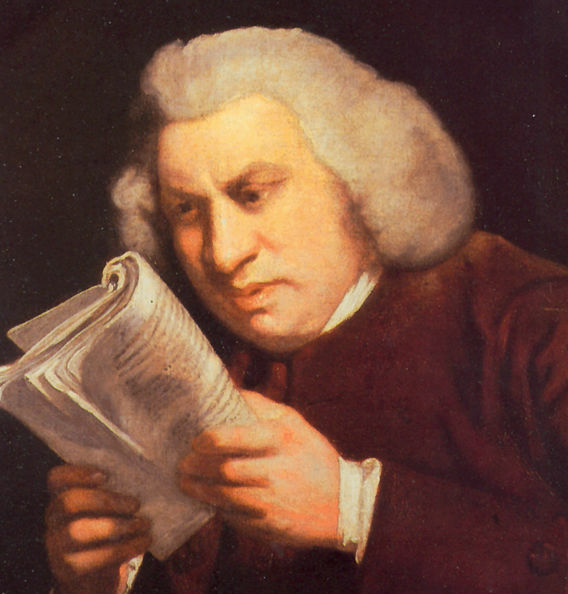 For the rest of his career, Johnson was ridiculed as a slow worker; he proposed to work up an edition of Shakespeare’s plays (the first ever single-source, authoritative edition that would be created) in 1756 and started to attract subscribers for the project, but by 1762 another writer took a public jibe at him: “He for subscribers baits his hook/and takes your cash, but where’s the book?” His Shakespeare was published in 1765. While he worked on his dictionary, he published a self-written, twice-weekly periodical, The Rambler, to earn a living. (In other words, he wrote a blog while he worked on his main project.) Then, while at work on his edition of Shakespeare, he published a weekly blog, um, magazine, called The Idler. Johnson had many health issues, ranging from regular bouts with a bleak depression, which he was the first to name “the black dog”; nearsightedness that glasses did not aid (or vanity made him avoid them); a disfiguring skin condition; and Tourette syndrome, a condition that did not have a name until the late 1800s and was not considered a medical condition in Johnson’s lifetime. The tics made him seem an odd character, and he felt he had to win people over with his wit n part to overcome his tics, his skin, his squint, his sadness. (Asked once why he made noises, he said it was a bad habit. It wasn’t.) His many tics and violent gesticulations are described in every contemporary account about him written by his friends, so the posthumous diagnosis seems to be a trustworthy one.